NOTE: NRS Mooring - 2016 was not recovered. It is a subsurface mooring, and may still be in the water at its original deployment location. 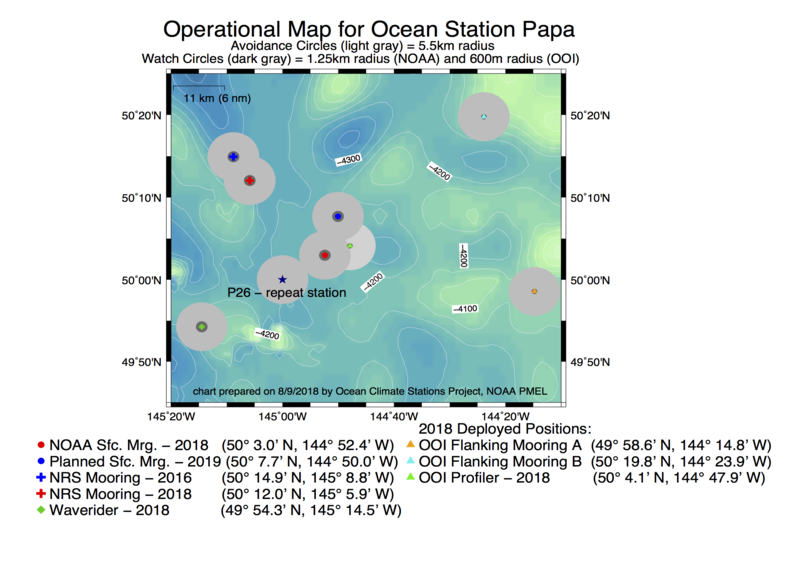 Ocean Station Papa, situated at 50°N, 145°W, was operated as an ocean weather station starting in December 1949. At that time, the weather ships were occupying Station Papa, and they kept doing so until 1981. After the withdrawal of the weather ships in 1981 the Line P/Station P Program was taken over by the Institute of Ocean Sciences from Fisheries and Oceans Canada (DFO). The program has been modified many times over the years. There are now three Line P cruises per year, generally in February, June, and August. Many collaborators from different institutions and universities are involved in Line P, although the core work is still managed and coordinated by DFO. The "North Pacific Carbon Cycle Project", led by Steve Emerson (University of Washington) and funded by the NSF Carbon and Water Cycle for the Earth System program, had three components: (1) study the time dependency of the carbon cycle at Station P through moored, glider and shipboard measurements; (2) measure pCO2 and oxygen isotope tracers of biological productivity (Δ17O, O2/Ar) using a Volunteer Observation Ship (VOS) that crosses the Pacific every other month; and (3) determine carbon fluxes and depth distributions not possible from a VOS using a research cruise between Hawaii and either Tokyo or Seattle, depending on ship scheduling. The overall goal of the project is to identify the importance of mixing and biological processes in controlling the air-sea flux of CO2 in the critical regions north of 35°N. 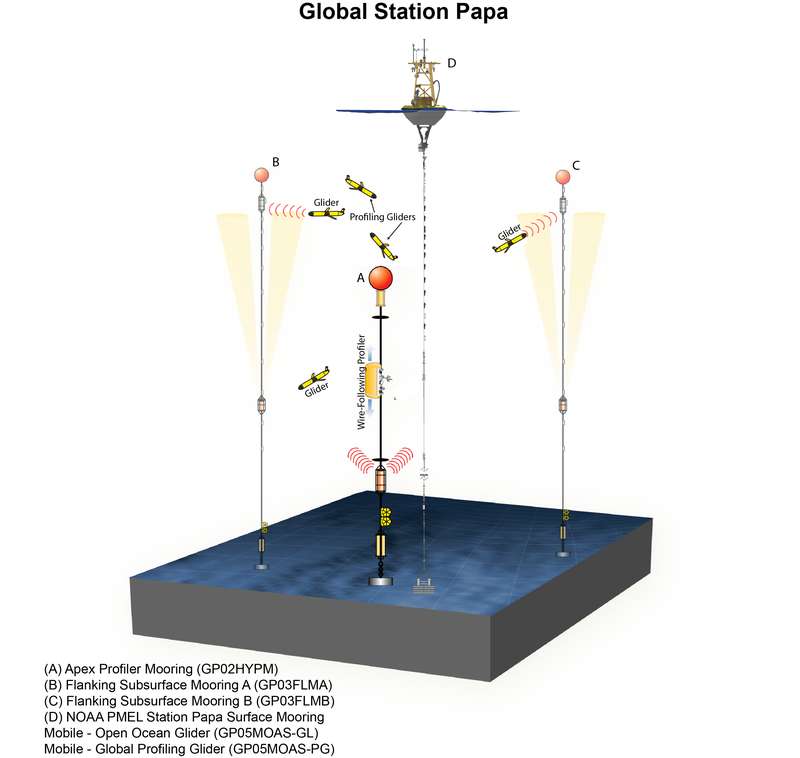 As part of a larger project to understand the impact of surface waves on the ocean mixed layer, a team of scientists from the Applied Physics Laboratory at the University of Washington, led by Jim Thomson, has been measuring waves at Ocean Weather Station Papa. The first deployment was on June 15, 2010 by OCS personnel, with subsequent deployments in October 2012 and December 2014 by the UW. Subsurface Acoustic Doppler Current Meter (ADCP) moorings to measure ocean currents were deployed from 2007 to 2010 at station Papa. These moorings measured ocean currents from the surface to depths of 700m. The OCS project contributed the floats and mooring line to this initiative, with ADCP instruments contributed by Dr. Matthew Alford, from the Applied Physics Laboratory at the Unviersity of Washington, and Jody Klymak from the University of Victoria (Canada). Dr. Jeffrey Nystuen of the Applied Physics Laboratory at the Unviersity of Washington, investigates ocean surface processes that affect the underwater sound field. He has developed a technique to acoustically monitor to detect and monitor rainfall at sea. His Passive Aquatic Listener (PAL) instruments have been deployed on the Waverider and subsurface ADCP moorings.